Hi, I’m Camilla and I’m a Bookaholic. My passion for writing came directly from my passion for reading. I love to write books that are sweet and romantic, and that will leave readers with a dreamy smile (sometimes also some LOL moments) on their faces. Please to meet you Camilla, I hope you will have fun today! Now onto the show, and remember everyone, Camilla hasn't been entirely truthful with three of these answers, so it is up to you to guess which ones they are (only 3 guesses per person though). J.K. Rowling. She created a magical world, made us speak a new language (muggles, squib, Azkaban, animagi, snitch, Quidditch …) they even had to put a 9 and ¾ platform at King Cross station. Harry Potter is my favourite series. Wuthering Heights by Emily Brontë. This is one of my favourite classics. I love everything about it, the story, the struggle, the characters. Heathcliff had me fascinated since I was a teenager. I re-read this book at least once a year. The island of Santorini in Greece. The island is beautiful, the Mediterranean Sea special, and everything just aligned to perfection during this vacation. Perfect hotel, perfect weather, and great food. 4) Please name a cocktail that would describe you perfectly, and what’s in it? Lemon drop martini. It has Vodka, Triple Sec, lemon juice and sugar. I like to think of it as sweet (sugar rim) and sour (lemon twist). Just like everyone else I suppose, I have sweets moments and bitchy ones. 5) If you could only read one author for the rest of your life (and I’m aware that’s a very scary world), who would you choose and why? I’m going to have to go back to answer number one and say J.K. Rowling. I never tire to re-read a Harry Potter book, and they’re definitely the most re-read in my library. Whenever I’m in a reading slump I go back to Harry Potter. I just re-started the whole series with the excuse that The Cursed Child is coming out this summer. I mean, I have to re-read the other seven books first, right? 6) If you could only look at one view for the rest of eternity, what or where would you like to be to see this view? But if I really had to be stuck in one place for the rest of my life I’d like it to be New York. It’s such a vibrant, lively city. I’d love to be there for eternity. 7) Besides reading, which I am guessing is a given, what other hobbies do you have? My biggest passion besides reading and writing is running, I’m currently training for my first half-marathon. My dream is to one day run (and finish) the New York marathon. 8) Who is your ideal Disney character? Belle, because she’s a book junkie. 9) If you could be an animal what would you be and why? I would like to be my cat. My biggest problems would be I’m over-cuddled and meowing for more food. 10) Can you describe for me what your perfect day would involve? Head to Starbucks for a croissant and a Caramel Macchiato. Kneading a pizza dough for later in the day. Have a homemade pizza dinner with the hubby. 11) If you won the lottery, how would you spend the money? 12) What superpower would you love to have? Magic tiding finger snap. Imagine snapping your fingers and the House cleaning and tiding itself. Listening to Pitch Perfect 1 and 2 soundtracks. 14) What is your best childhood memory? Thanks so much for agreeing to take part Camilla, I also love Belle from Beauty and the Beast, and I'm so envious you got to go to Santorini, it looks so pretty in the pictures. What if the man you've always loved isn't the right one for you? Rose Atwood has been in love with her best friend since she was twelve years old. The only problem is, he's the biggest player to have ever landed on Earth. Rose has waited forever for Tyler to grow up, all the while keeping her feelings under wraps for fear of getting hurt. But after watching Tyler go through girl after girl, Rose has lost hope he'll ever change. Being Tyler's best friend is becoming more difficult with every passing year and every new woman in his life--especially when the girlfriend du jour is Georgiana, a snotty, beautiful girl who's in Law School with them and who never leaves Tyler's side. When Rose, dumped by her long-term boyfriend, moves temporarily into Tyler's apartment, tension spikes. Georgiana wants Rose out of the house. Rose wants Georgiana out of Tyler's life. And Tyler ... well, he doesn't really know what he wants. As an unexpected argument brings Rose and Tyler closer than they've ever been, they must decide if there's more to their relationship than being just friends. And they must do it quickly, as Georgiana is determined to do everything in her power to keep Tyler and Rose apart. After all, all is fair in love and war. 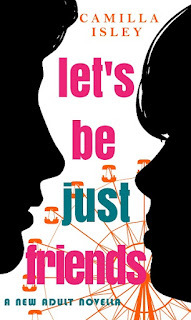 Let's Be Just Friends is a fast paced, captivating college romance that will keep you glued to the pages with humor, heartbreak, and romance. 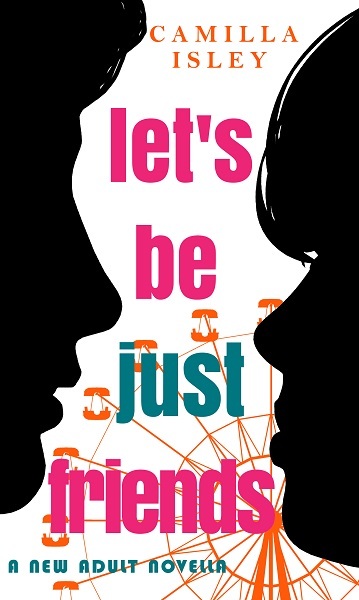 It's a story about friendship, love, and the choices we make. Besides writing, I love reading (surprise, surprise), cooking—and eating—especially pasta, going to the movies and obviously ordering a gigantic bowl of popcorn, and watching too much bad TV. I understand that mosquitoes play a role in the ecosystem as a part of other animals’ diet, and I don’t want to starve all those frog princes out there, but I could really live without them! I'm going for 1, 6 and 7.